It’s cold outside – time to make hearty soups and stews! 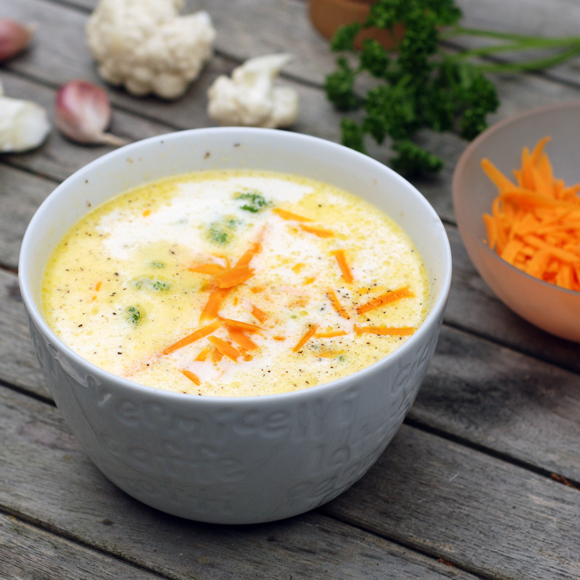 This cauliflower soup recipe is very simple, but utterly delicious. Basically, you just need to boil cauliflower in stock, add lots of fat (in form of cream and cheddar cheese) and season! This is an expanded recipe from the classic low-carb cauliflower dishes round-up earlier this year. By the way – the orange bits on the photo come from grated Red Leicester cheese, which is similar to cheddar. They are not carrots! Before we get to the actual recipe, let’s talk about stock. Without a doubt, making your own stock at home is much better than buying it ready-made from a shop. And I hope you would never resort to the horror of using stock cubes – that is just wrong on so many levels. Making your own stock (or indeed any other food) from scratch ensures that you know exactly what goes inside! You can ensure that it has no added carbs or ghastly taste-enhancing chemicals. If you never tried making your own stock, it might seem like a daunting prospect (one of my Twitter followers was once absolutely freaked out by this suggestion), but in reality, nothing could be simpler. You just need to save any leftover bones (pretty much anything will do – roast chicken, beef, lamb, fish), and boil them with water. That’s pretty much it! You can season it and add nice herbs like bay leaf or bouquet garni, but that’s optional. Some people also add vegetables such as carrots, celery and onions, that are later discarded, but if you are following a low-carb diet, you can skip this, ensuring no extra smithereens of carbs sneak into your stock. 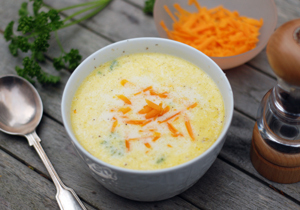 Creamy and rich cauliflower soup with cheddar - low carb and high fat. 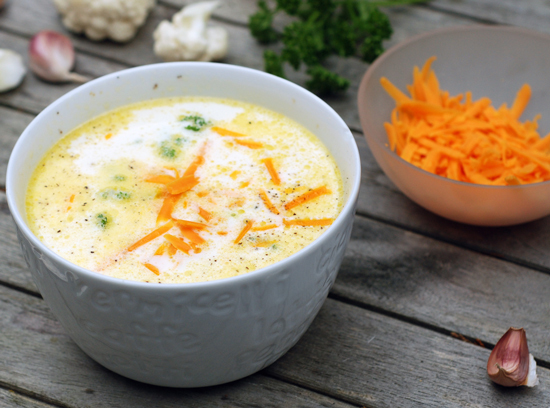 Do you need more low-carb soup recipes? Love this recipe – so simple to make! I used coconut milk instead of heavy cream, and added some curry powder for a little extra kick. It turned out great! This is one of my staples! I love this soup! So easy and tastes amazing! You have net carbs what is regular carb amount. Amazing! Super easy and I multiplied it b/c I love having leftovers for my other keto friends! Thank you Michelle 🙂 I am so glad you enjoyed the recipe. This recipe is so simple, but absolutely fantastic!! Soooo delicious! I have made it over and over and over and over…. The nutmeg is the key ingredient and is what makes it so unique, tasty, and stand out from all the rest. I like the fact that it doesn’t have the onions that many other recipes have. I added 1/2 cup of carrots and 1 1/2 cup of celery to mine, only because I had mistakenly started out making a different recipe, and ended up making this one instead but did not want to waste the vegetables. I have also added a small pinch of cayenne pepper to mine because my husband tends to like things a little spicier. Thanks for sharing this wonderful recipe! Thank you, Tanya! Your comment made my day 🙂 I am so glad you liked the recipe. And thank you for sharing the tip about additional veggies and spices – sounds yum! Hmmm… You could try mashing the cauliflower with a potato masher. But it is very laborious. You don’t need a full-scale food processor for this. A cheap blender would do the trick for this recipe – as well as many other jobs in the kitchen. Fantastic! I am so glad it worked out for you. Many thanks for leaving your feedback! This was perfect! I didn’t use the nutmeg.. I added a stick of garlic Kerry gold butter as well. Made this with chicken bone broth and roasted cauliflower. So good! Roasted cauliflower! I like your thinking 🙂 Thank you for sharing this tip. Does this keep well in the fridge for a few days? I’m thinking about making a weeks worth of lunches using this recipe. 4 days worth to be exact. Hi Amy, yes, I think that should be fine. If you want to keep it for longer, you can freeze it as well. This looks good. Would I be able to use frozen cauliflower, or would it be too mushy? Thank you. Yum, just made this and I could eat it by the bucketload. Great 🙂 I am very glad you like it. Made this tonight – it’s wonderful! I love garlic so I used a whole head of fresh garlic. Will definitely make this again. Awesome. Tried it and its very nice. That’s great! Thanks for letting me know, I am very glad you liked it.